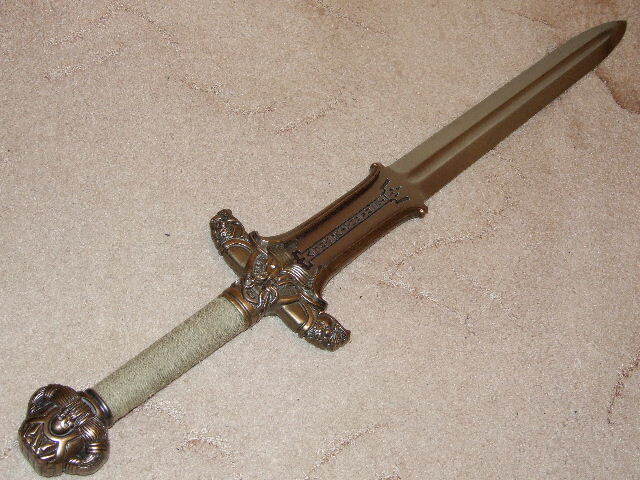 So I've recently become interested in getting one of the original Conan swords used in the movies when I ran across the review posted for the one made by Albion. I really enjoyed the read, so I decided to stop by and ask some questions :-). As I understand it, Albion no longer makes either the Atlantean nor the Father's sword anymore (much to my regret). I've found though that a person named Marto also made swords based on these two models. I was wondering whether anyone had any comments on this maker. Is he any good? Have you heard anything about him? Quality? Marto is a large factory located in Spain that makes production swords, not an individual maker of custom swords. Ah, thank you for the clarification :-). As to the quality of their work, would you say that they make good swords? The Marto Atlantean was one of the first swords that I bought, before I'd ever heard of A&A or Patrick Barta etc. To my mind it does stand out from a lot of the cheap movie junk, to the degree that it is the only piece from that phase of my collection that I've still got. It is stainless steel and very heavy, but the detail is pretty good if you just want something to hang on the wall. The Fathers sword on the other hand is not quite so good. The grip is wrong, as is the detail on the pommel. There is also an engraved section missing from the lower section of the blade. Having said all that, the skull and antler cross-guard is very good, especially considering the price. So if you want something that looks good on the wall, I don't think these are too bad, but as has already been mentioned these are not functional swords. Kult of Athena has both Albion swords listed in stock right now. Both the father and atlantean. That could assuage your disappointment! Thanks for all the answers, guys. (especially about Kult of Athena). If you don't mind my asking, Darrin; Did you get the Epic edition or the Special edition of the Father's sword?